During normal mode, pressing the VSC OFF switch for a short amount of time changes vehicle to AUTO LSD mode. When replacing the brake actuator assembly, perform calibration (See page ). (e) Select CAN Bus Check from the System Selection Menu screen and follow the prompts on the screen to inspect the CAN bus (See page ). CAN Bus Check indicates no malfunctions in CAN communication. (e) Enter the following menus: Body Electrical / Combination Meter / Active Test. (f) According to the display on the Techstream, perform the Active Test. (g) Check that the AUTO LSD indicator light on the combination meter assembly turns on or off in accordance with the Techstream operation. The AUTO LSD indicator light turns on or off in accordance with the Techstream operation. (a) Disconnect the S1 skid control ECU connector. 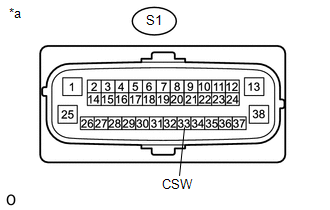 (c) Reconnect the S1 skid control ECU connector. 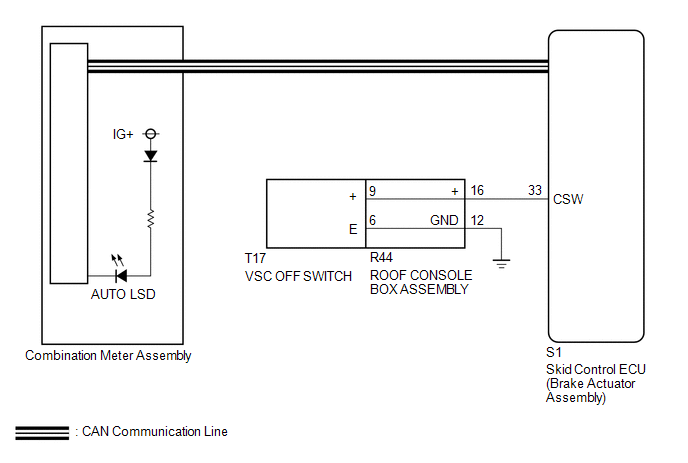 (b) Remove the VSC OFF switch (See page ). (c) Inspect the VSC OFF switch (See page ). The VSC OFF switch operates normally.